Sideshow has been hitting us hard with the new Planet of the Apes figures, with six landing on the doorstep in what seems like no time! 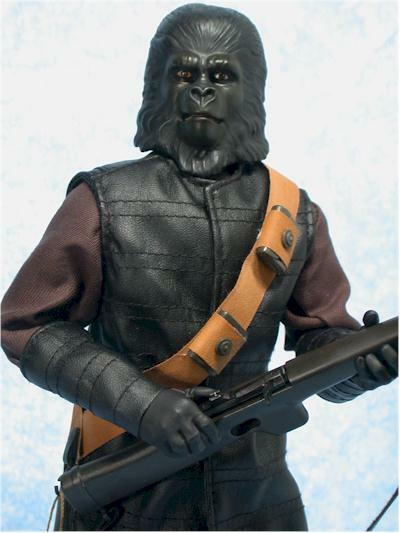 First it was Dr. Zauis and the exclusive version, then Zira and Cornelius, and now both the Gorilla Soldier and the exclusive Ape Marauder! Both of these are actually called 'Gorilla Soldiers' on the box, but their specific names are Ape Enforcer (a general release of 4000 figures) and the Ape Marauder (an exclusive release of just 500). The Enforcer is $40 through the Sideshow site, while the Marauder is $45. 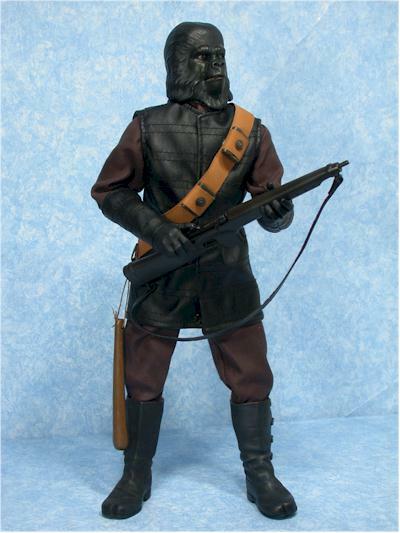 While the two apes and their costumes are identical, the Marauder comes with a couple different accessories. See, he's one of the guys that was dragging the humans along by the neck, not one of the more general looking soldiers. With such a low production number on these, I suspect the overall license is weaker that Sideshow was hoping. Still, I bet we see at least a couple sixth scale additions to the line announced next month at Toy Fair. I like the POTA work quite a bit, and I was very surprised to not find the neck twisty running all the way through the cardboard insert. However, there's so many of them damn little nylon strings holding stuff in...they aren't my favorite. Still, the graphics are great, and the box is fairly collector friendly. Nice work once again, and if they could replace the strings with a top tray to hold stuff in, I'd be thrilled. 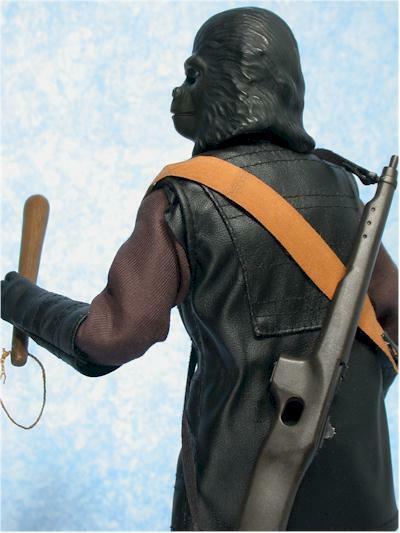 The POTA line has been plagued by one problem with their sculpts - they are simply too soft. This is gorilla hair folks, and should have some depth and sharpness to its detail. I mentioned this with the Zaius sculpt, but cut them slack on Zira and Cornelius because they managed to capture the overall likeness so well. But here we are back to a more generic gorilla sculpt, and the lack of detail and definition in the hair really hurts what otherwise could have been a fantastic sculpt. The hand sculpts work well with the accessories, especially the rifle. You'll have to play around a bit to get the club to work right, but it's still possible. The thinner Man Catcher has issues, but if you use the softer fingers to your advantage, you'll manage to get the Marauder to hold that as well. There is NO difference in the sculpts between these two, and Sideshow used the smaller male body once again so that these characters will be shorter than Taylor. The paint ops don't help the soft sculpt in this case, since black tends to wash out detail in the best cases. 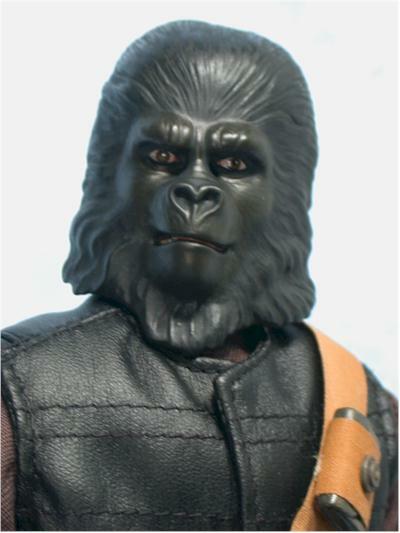 The prototypes for these apes had a shinier gloss finish on the face, with a matte finish on the hair. This was a good move, because it visually differentiated between the two textures. Unfortunately, the final versions don't have much difference, and the matte black appears to just be all one identical color. This means the hair and face tend to look all the same, and that doesn't help the lack of detail or add to the realism. In general though, the paint ops are clean and neat. The eyes are well done, and what color there is, is clean and consistent. The smaller male Sideshow body is used, and works quite well. The joints were slightly loose, but not bad enough to cause any issues with standing. The head sculpt and hair tends to make the neck less useful, but in general the body has all the articulation you could want plus some. 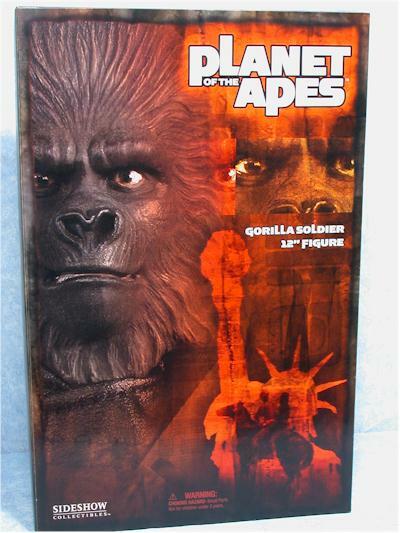 Both Apes come with two main accessories, plus the usual Sideshow display stand. You won't need to use the stand with either, but it's nice to have for consistency. The Enforcer comes with the rough looking rifle, and it has a moving bolt action. The strap fits well over his shoulder, and the gun fits perfectly in his hands. He also comes with his club, which is made from a soft rubber rather than stiff plastic, making it seem more like a black jack than a standard club. The rope on the handle can be attached to the hook on his shoulder belt. 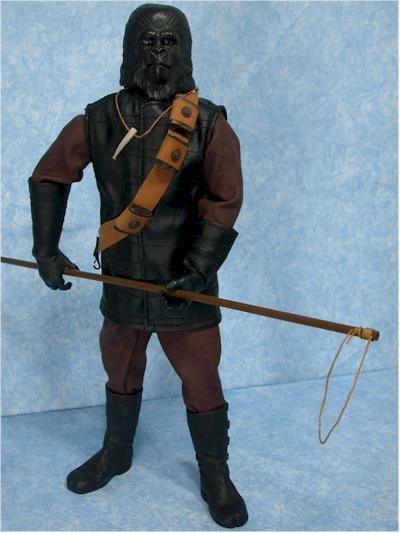 The Marauder comes with the 'man catcher', a pole and noose similar to those used by animal catchers to curtail dangerous creatures. The nifty thing is that it actually works! The rope runs inside the length of the plastic pole, and can be pulled tight or loosened up from the end. This was a big surprise for me, and is a very nice touch. He also comes with a whistle, used to call the other apes. It's really a bone whistle, hanging on a string that can go around his neck. 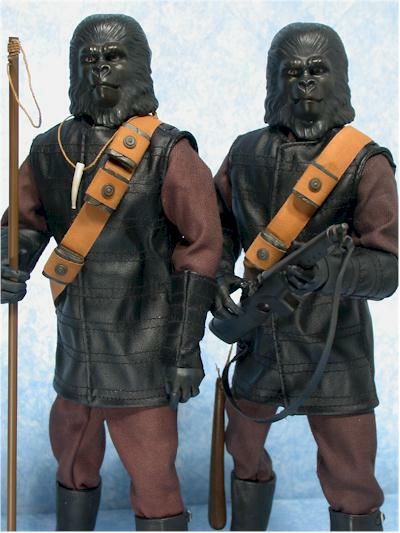 Both apes sport identical black outfits, looking quite oppressive in their Fascist duds. There's the black pants and black shirt, which are well tailored and made from very high quality material. The shirt has black pleather cuffs, which match the appearance of the black vest. The vest buttons down the front, and also fits extremely well. You'll have to fluff it out a bit after you remove him, as he has a plastic tie around his waist that crunches it up, but it will look great with a little effort. The boot sculpts are excellent, and they are made from a soft rubber. The buckles look extremely realistic, and they fit quite tightly. Finally, they both have a shoulder belt with ammo and a clip for a club. Of course, since only the Enforcer has a club, it's only really useful for him. The exclusive Marauder has three clips, while the Enforcer only has two. Of the POTA line so far, these two sport the best costumes. I'm hoping we see this kind of work on the various Taylor versions as well. Even kids that have no idea about the films should find these big monkeys a lot of fun. They have cool outfits, great weapons, and can be the bad guys in just about any scenario. The only thing cooler than robot dinosaurs is monkeys dressed up like people. Unfortunately, this line remains one of the more expensive. At $40 and $45, these two are certainly on the high side, especially the Marauder. His exclusivity drives up the price of course, but it also means you won't be able to pick him up at other dealers for cheap, unlike the Enforcer. So far, I'm pretty pleased with the line. I do very much wish that the sculpts had better definition and detail, especially in the hair, but the costumes and accessories have been solid. The newer, smaller bodies are also quite welcome, and open up many other possibilities for Sideshow with other licenses. While the Marauder is cool, if you can only afford to pick up one, you have to get the Enforcer. You have to get the one with the standard gun and club, since that's what they carried 95% of the time, and he'll look better on your shelf. If you can swing the extra bucks, pick up the Marauder now, because at only 500 produced, he's not going to be around forever. The small strings of the Man Catcher and the necklace have those little nylon strings holding them in the package. If you have to resort to cutting these white strings, be very careful - it would be quite easy to accidentally cut the ropes! - Sideshow still has some of the regular version and exclusive version still available. They also have the regular Taylor, and the Taylor/Nova two pack still available. - Alter Ego Comics has the regular version for just $32. - Southern Island has the enforcer for $35. - Killer Toys has him for $35.